I don’t quite know what to do with this photo except to admire it and try to add some meaning to its simplicity and beauty. It was taken by a good friend, Laura Sinclair, with whom I share a Christmas Eve birthday. 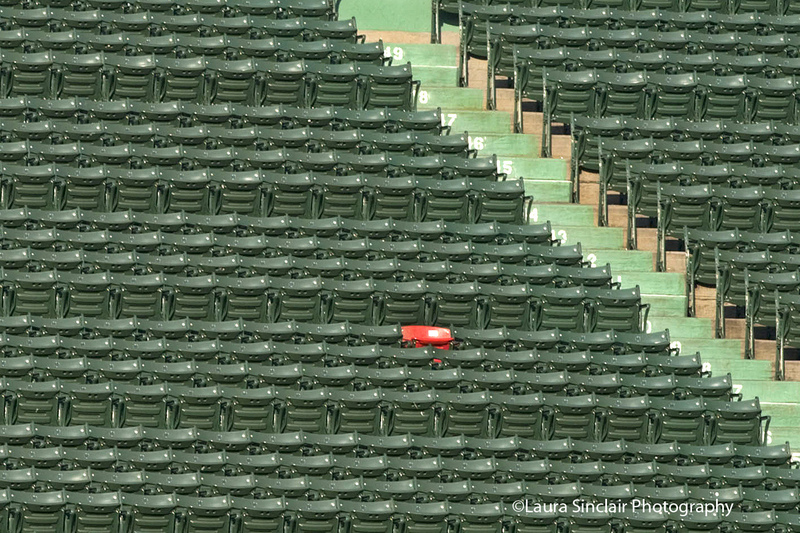 It was taken earlier this year and is, of course, the seat that supposedly was hit by the longest home run at Fenway park, well up into the right field bleachers. It says the next big thing, if you will, that one individual can change the landscape for many, if that one individual is either in the right place at the right time through fate, or that individual is willing to be different and willing to stand alone in their beliefs or accomplishments. It is more than just a red seat if you believe it is. For me right now, it’s a picture ready to be framed and given as a holiday gift for someone who might appreciate the significance. Whatever! Obviously, we are moving into the time of put up or shut up for the local 9. Lester holds the key and Buckholtz is a mystery. If both are less than what we expected them or needed them to be at the start of the season, then the next two months could be brutal. There have been plenty of people who have come and gone for one reason or another. Hanrahan, Bailey, Miller, Middlebrooks, Aceves. It's been about as creative a roster as ever has been presented to Red Sox nation and, so far, it has done what it was supposed to. They are not running away from anything, although they are an improbable 20 games above .500. It appears as the race shakes out, Baltimore and Tampa are the enemy and the Sox are about to meet them face to face in the next week. Lackey is the greatest surprise, Ellsbury has been spectacular. When Victorino stays on the field, he is special. Iglesias is world class, and on and on. Can't tell the future, but we can check out the recent past to see why they are where they are. So many games they have won this year that would have been losses last year. I also want to give you an inside look at the non-player control room that puts the magic up on the electronic walls of the ball park. 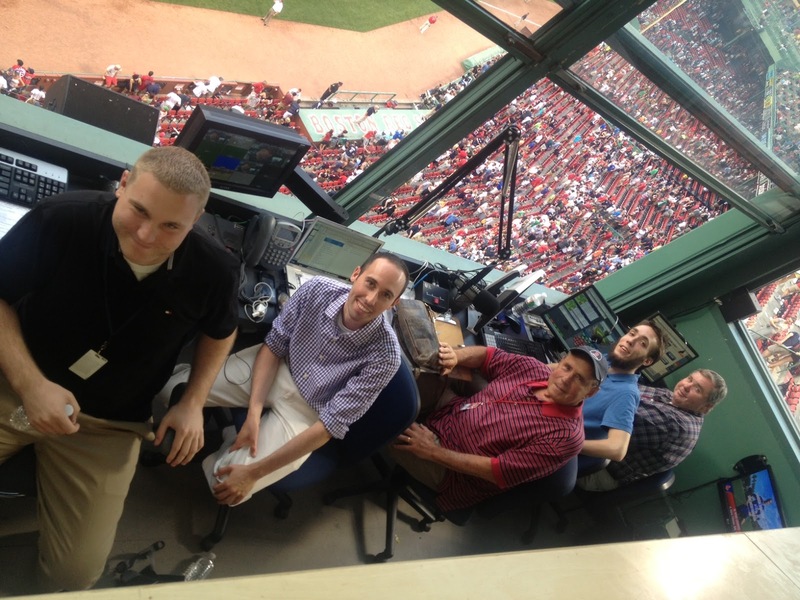 From left to right: Steve Roman, Jack Lanzillotti, Bob Lobel, Sean Kujawa and Mike Gaffney. The control room is heavily air conditioned with all the electronic equipment housed there. The five people (pictured) in the front row, except for one, could be found behind the genius bar at an Apple store. The one that would have no clue in that department is the one in the middle, behind the microphone. He just reads the script he is give by a group of back up writers and planners. To the left of the Public Address guy in the middle is the producer who tells the announcer when to talk and when to slow down or speed up to coordinate words with video on the scoreboard. He also is in contact with NESN, Fox or ESPN on the telecast to coordinate with their video and breaks. He kinda runs the show. All pronunciations go through him. Make a mistake, and you have to answer to him. Every player on the home team has special music to come to bat with. Also, the music in the park is coordinated with announcements as the guy nearest to the camera is the “music man," a sound genius. The two guys on the right of the announcer do the button pushing, the ball and strike lights, every board operation, the pitch count, the speed of pitches, situational statistics… Everything you could possibly imagine, and probably take for granted. It's an amazing operation and requires focus, baseball knowledge and smarts. The one guy in the middle is exempt from all of the above.. He just reads the script. One thing I'm sure you can identify with is the fact that, while it’s a great place to watch a game, these people are doing a lot more than watching a game. They are working it and making it look easy so the fan can get the whole in park experience. Hey, it's just something I thought most people would like to see. As you can tell, not a whole lot of room for friends and relatives to visit. That's reserved for before and after games. I loved the picture--a framer for sure--and found the behind-the-scenes article very interesting. I'm willing to bet, however, that when it comes to baseball knowledge, Mr. Lobel knows just as much as anyone in that little room!